Want to be notified when new issues are released? Follow @WalterHaleTales on Twitter or sign up for email announcements. Here are the time-lapse drawings from Issue 3. The interior of this one is pretty long, but I think it’s interesting to see me working through a lot of different ideas trying to figure out how to tell the story. This is my first issue with words, so I didn’t have a template to work from. Watch in full screen for a better view. You can purchase this issue on the Walter Hale Shop on Etsy. One feature I would really love to have in Procreate is the ability to create some kind of grids. But I’ve been able to work around the absence of that feature by importing grid images created externally. I created my grids on my computer with Sketch, but you could easily use Illustrator or another graphics program instead. I settled on a 6 panel (2×3) grid for my comic. I draw the panels in Sketch and then export a PNG image of the panels. The only trick here is that the PNG should be the exact same size as your Procreate document to make importing easier. If both are the same size then when you import the grid image it will align perfectly with your document, no resizing or repositioning necessary. This means you need to include the blank areas in the margins around your grids in the exported PNG. Once I have the grid PNG, I AirDrop it over to the iPad, where it gets saved to my Photos app. From there I simply need to import it into my Procreate canvas. I like to have my panel outlines hand-drawn. So I use the Sketch grid as a background guide and trace over them with Quick Lines in Procreate. This means I only need to create the one 6 panel grid and I can trace over it in different ways to create different panel layouts. If you want to have vector-drawn panels, then you’d need to export all the different panel variations you want to use as PNGs. In addition to my 6 panel grid, I also created an image of line-rules to use as a lettering guide. I don’t use it a lot, but it comes in handy to keep all my lettering aligned and evenly sized. To keep from having to go through the import process each time, I keep a template document in Procreate that is properly sized and has the grids already imported. When I want to start a new document I just duplicate the template and I have everything I need all ready to go. Today I sent in my application for the Creators for Creators grant. My proposal for the grant is a 64 page book based on Walter Hale. 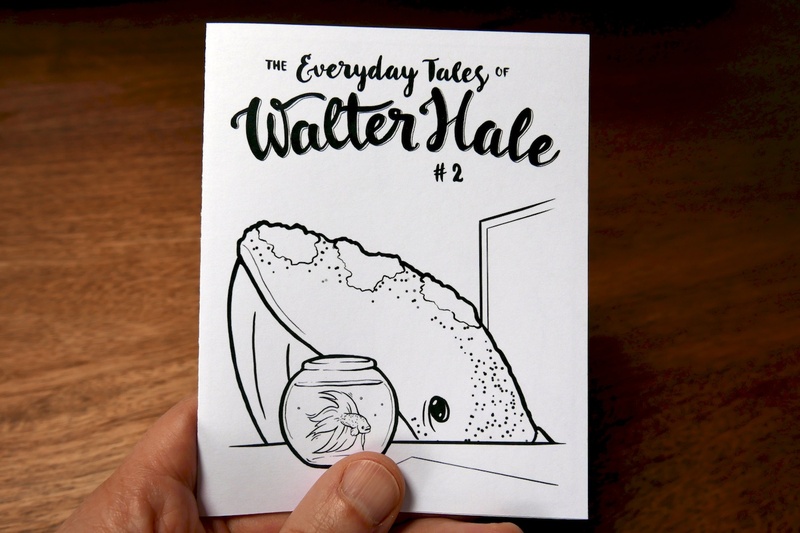 While the minicomics so far have been standalone stories just focused on specific moments in Walter’s life, the longer book would be a more in-depth, continuous narrative. The story that I proposed for the book is below. 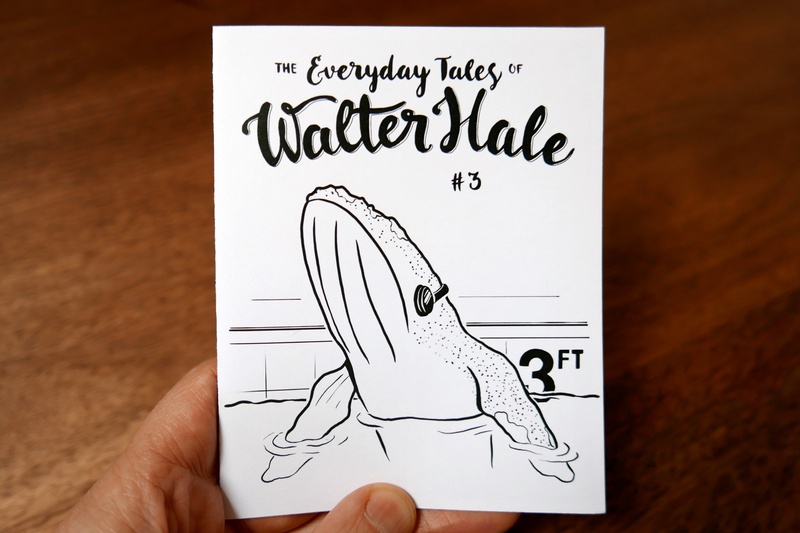 The Epic Tale of Walter Hale is a fish-out-of-water story (not literally: whales are mammals, not fish). 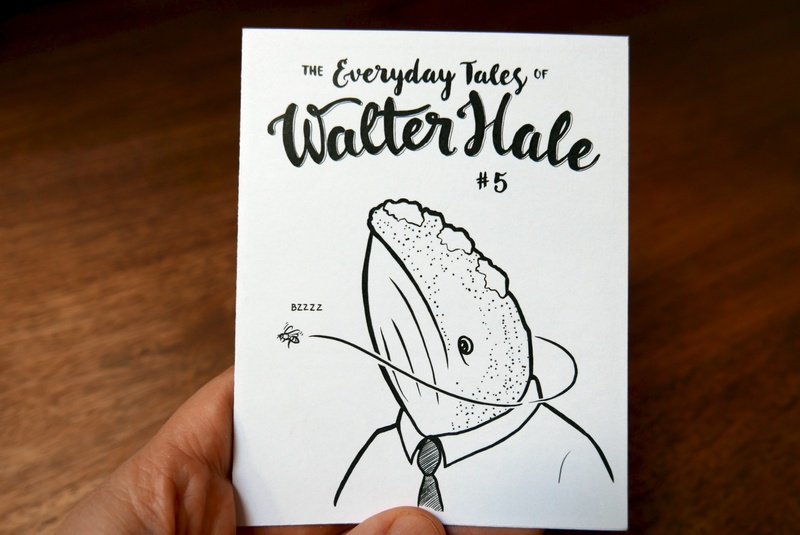 Walter Hale is a humpback whale working in a soul crushing office job. He spends his days surrounded by people — stuck in heavy traffic, crammed into crowded elevators, and packed into his tiny cubicle in an overfull office building — yet he is alone. Walter has always felt alienated from his fellow man. He doesn’t fit in this world, and spends his time daydreaming about swimming free in the vast ocean. One day, as he sits alone in the window at his local coffee shop, Walter sees another whale pass by. He jumps up from his table and rushes out to the street, but the whale is already lost in the bustle of the city. In the following weeks, Walter continues to see this other whale around town — standing on the street corner as Walter rides by on the bus, driving in the opposite direction in slow moving traffic. Finally one night Walter sees the whale walking near the beach and pursues him. He follows the whale down to the shore. Walter calls out, but the whale continues straight into the ocean. He chases after the whale, but not being a strong swimmer, Walter loses the whale in the waves and the darkness. Choking on seawater and gasping for breath, Walter retreats to the shore. He sits in the sand and sobs. Walter begins swimming laps at his local gym in order to improve his stroke. Some of his coworkers see him at the gym and invite him to train with them for an upcoming open-water race. As Walter develops friendships with his training partners, he feels a new conflict: Is he learning to be more content with his place in this world or is he giving up on his dream of swimming free? On the big day Walter dives into the waves as the race begins. Rounding the first buoy, he races to catch the lead swimmer, but as he closes the gap realizes that he has mistaken the mystery whale for a fellow swimmer. The whale leaves the race course and swims out toward the horizon. Walter stops, treading water, unsure, as he looks from the whale receding into the distance to his friends cheering for him from the shore. The story ends ambiguously with a frame showing the first few swimmers emerging from the water and crossing the finish line. Does Walter return to shore and finish the race, or does he swim away to join the mystery whale? Here are my time-lapse drawings from Issue 2. I used a lot more photo reference in this issue because I wanted to make sure to get the proportions right on all the different animals. You can see the time-lapse movies from Issue 1 here. Both issues are available for purchase on Etsy. In Issue 2 Walter visits some underwater pals, and a new friend joins him for lunch at the office. I draw my comics on an iPad Pro with an Apple Pencil. I’m using the smaller 9.7 inch iPad. I debated which size to get, but chose the smaller version since it’s a bit more portable. I like that it’s easy to throw in my bag and go sketch at the bar or the coffee shop. I think the larger version would be much nicer for drawing though. Sometimes I still wish I had chosen the bigger size. I have a few small gripes about the Apple Pencil. but overall I think it’s great. The feeling of the hard plastic tip on glass is not that pleasant (compared to the feel of drawing on paper), but you get used to it. I also find that the tip frequently comes loose while I’m drawing. I don’t know if it’s a common problem or just my specific unit, but I’ve gotten in the habit of just continually twisting it to make sure it’s tight. Even with those shorcomings, there’s no reason to even consider using a different stylus with iPad Pro. I tried a lot of different drawing apps, and chose Procreate as my clear favorite. For drawing comics, I don’t think anything else on the iPad can even come close. It took me a while to get comfortable with the tools and get everything tuned to work with my drawing style, but now that I have it all set up I’m loving it. I draw my comics 100% digitally, but it would be easy to import a scan of a sketch and finalize the drawing on the iPad as well. Once the comic is complete, I export a PNG of the finished artwork and assemble the PNGs for the front and back into a PDF file for printing. If I were drawing a webcomic I could just post that PNG online instead. I plan to make some more detailed posts about specific techniques in the future, but that’s the general overview. If you have any questions about my process contact me and I’ll try to answer them here. One of my favorite things about the Procreate app is the time-lapse recording feature. It’s fascinating to be a able to watch a movie of a drawing getting created. I never remember how many revisions and retouches I went through to get to the final drawing until I go back and watch the replay. You can read issue 1 here, or purchase printed issues on Etsy. Follow @walterhaletales for updates. 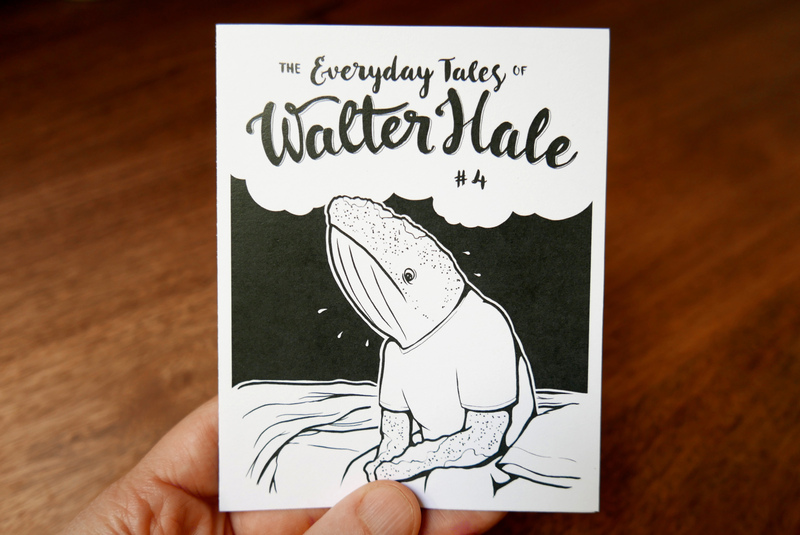 Walter Hale comics are created by Cadin Batrack.